Congratulations to the YJP Executive Board. JAINA wishes you all the best for all your endeavors. We are sure YJP will reach new heights under the new Executive Board. JAINA delegation has reached India and would be attending several functions in India where JAINA has a tie-up or is doing social project. 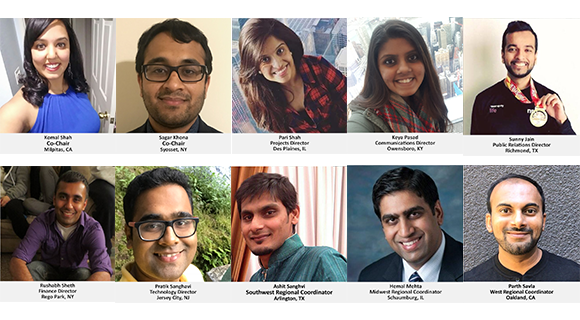 If you will be in India from January 17 to January 28, 2018, and like to join the delegation, please send an email to jainahq@jaina.org. "Conquer anger by forgiveness, pride by humility, deceit by straight-forwardness and greed by contentment." Q 1: How many karmas do Arihant Bhagwans have left? Q 2: What are the Bhavanas? A unique art festival in Shravanabelagola is being held on the auspicious occasion of the Mahamastakabhisheka in February 2018. 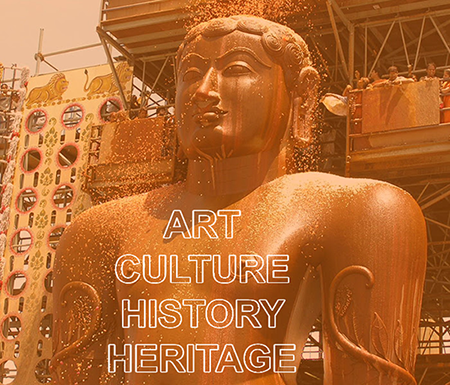 The festival is an effort to bring the history and heritage of Shravanabelagola and Bhagwan Bahubali on canvas in a modern and contemporary style. An art camp and workshop at Shravanabelagola in January 2018. Live painting sessions during the Abhishek. An exhibition of the artwork in a specially designed 4000 sq ft gallery. Under the Ryan tree, we see a set of large footsteps covered in silver foil, sprinkled with flowers. It is said that this is the exact spot from where Adinath gave his first sermon, and is very sacred to Jains. Jains perform the third of the five required rituals of Chaityavandan here. Walking past the Ryan footsteps, walk towards the small shrines. The first shrine against the wall is a temple showing Adinath in the kāyotsarga position flanked by his grandsons Nami and Vinami. Kayotsarga is the absence of concern for the body. This commonly refers to a standing or sitting posture of deep meditation. In the standing position, the eyes are concentrated on the tip of the nose and the arms hang loosely by the body. The individual remains unaffected by whatever happens around him. Rotis: Shift both the flours. Add salt to the flour and knead the flour with water to make the dough. Roll a roti/tortilla from the dough and roast on the griddle. Make all the rotis in similar way. Stuffing: Boil the bananas in a pressure cooker. Peel and mash them. Add mango powder, coriander leaves, chilli paste and salt. Mix well. When serving, place roti on the griddle. Spread stuffing on the roti. Sprinkle chopped tomatoes and cheese (optional). Roll up rotis and roast it putting some ghee or butter. Serve with coriander chutney and tomato ketchup. Father replied again," This is crow". The son asked again and again what was that. Father said, with love, again and again that it was a crow. "Why don't you keep quiet? It is no concern of yours who had come. Why do you keep on asking questions?" The father sighed and held his head with his hand in deep pain and said," Oh my son, just asking the question a second time you have become so angry. While you used to ask me the same thing many times, I would reply patiently what it was". The children who do not respect their parents are bad children. You should always think that your parents spent so much money on you and gave you so much love, you should also spend your money and love for your parents. Congratulate to Young Jain Professional(YJP) for new executive board 2018. 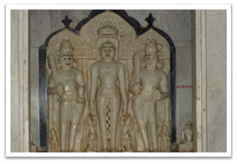 In this month’s YJA Pathshala lesson, we explore this history after Bhagwan Mahavir and see how Jainism has both left an impact and been impacted over time. To see this month’s content, head to yja.org/pathshala. Happy learning! Without further ado, we’d like to unveil the theme and logo for the 2018 YJA Convention - Reconnecting with our Roots! Get excited - with 2018 finally here, the Convention is only 6 months away! We hope to see you in Chicago, back where it all began! Only 9 days until our Clothing Drive ends! Donate this giving season to those in need. Check out our drop off locations here. A 1: Arihant Bhagwan has four karmas left. A 2: Bhavana means mental thinking.